At VECTOR WELDING you get the latest technology for TIG welding and only find the best equipment in our assortment. Various functions ensure efficient and easy working in any situation. The best results are achieved by the best welding equipment. As a leading TIG welding machine dealer, we offer you high-quality equipment that will convince even in demanding work. The innovative TIG welding machines are ideal for professional use and can be found in many large companies. 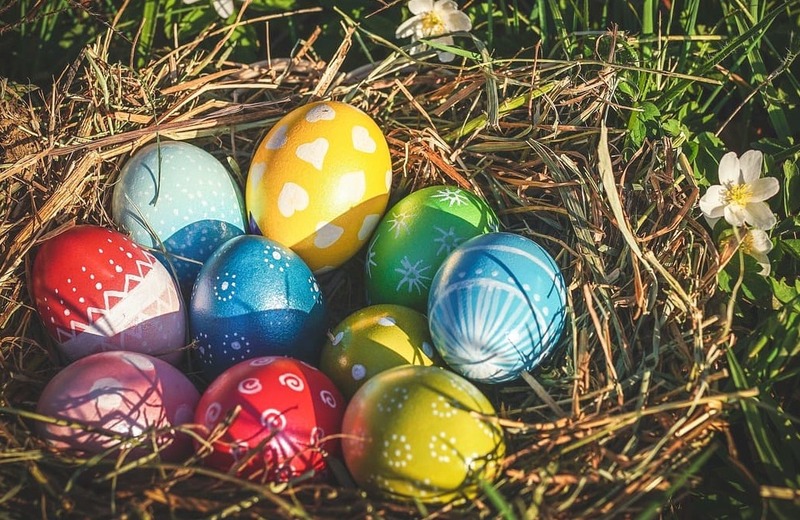 Due to the good ratio of price / performance they are also used gladly in the home area. Our three series cover all needs for home and professional use. The basic units of the SWIM-SERIES are cost-effective and deliver all important functions. They are of the highest quality and very robust and thus also suitable for demanding work. Easy handling thanks to the useful functions of the inverter welding machines is convincing in all respects and ensures a clean result for all welding inserts. The further development of the previous protective gas welding machine series can be enhanced by additional functions which are advantageous for professional applications. The S-SERIES has further focused on demanding work and is a relief for everyday use with the TIG welding machine. In addition, the housing has been designed to be significantly more stable, which provides more security and application possibilities. The VECTOR-DIGITAL TIG welding machines have been independently designed for the other series. These professional welding inverters are equipped with the latest developments and additional functions to achieve the best possible result. Extremely precise operation is ensured by full digital support and goes easily from the hand. Many additional functions are perfectly matched to the versatile working environment and make working with the professional TIG welding devices a real pleasure. The protective gas welding machine generates an arc in TIG welding with high-performance igniters, which allows the material to melt. In this process, TIG welding gas is added to prevent the oxidation of the material. In addition, a welding wire is added to ensure accurate control of TIG welding and extremely accurate results. The TIG welding machines consume little energy and are extremely powerful in spite of a compact design. The TIG welding system is therefore very mobile and very practical. Low energy consumption and resource-conserving operation are good for the environment and labor costs. If you need to buy a welding machine, we will always be at your disposal. 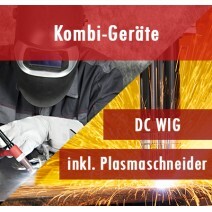 The best WIG welding machine should always be used for various jobs and we will gladly explain the possibilities and the advantages and disadvantages of the welding torches. 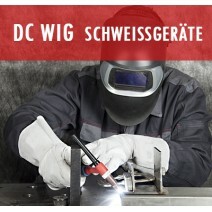 Of course we also have the suitable welding accessories for daily use or for special projects. Our welding equipment shielding gas, cooling devices and wire feeders are of best processing and meet all requirements. 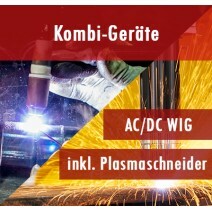 WIG welding machines of the new generation work with direct current or alternating current, and steels and aluminum welding become an easy task. Various control functions or pulsed welding current enable precise matching to specific situations and make TIG welding enormously easier. The direct current DC systems are usually used for working with steel, stainless steel, brass or copper. The alternating current AC (Altercurrent), on the other hand, is used for aluminum or its alloys. All of our TIG welding machines with inverter technology are known for their high performance ratio. We are constantly working on the development of the inverter welding machines and you will only find the latest and most proven models. State-of-the-art technology and functionality paired with excellent quality guarantee a long life, even if the TIG welding machine is often used in different situations. The sophisticated technology converts most of the current into usable welding current and thus has a low energy consumption as well as a long service life. These properties are convincing and the TIG welding machines are in great demand. With the inverter welding machines you have a long time of pleasure and can always achieve the best results. 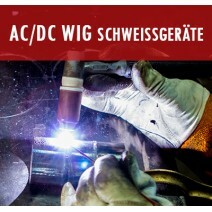 Our AC / DC welding machines are also popular when it comes to aluminum welding. The alternating current allows liquid working and produces a clean weld. Alloy welding is also possible with a TIG welding machine for less experienced workers and is easy to handle. This comes through a variety of useful features that allow a much more efficient work. A great advantage is the setting to the speed at which the welding additives are added. This results in a very clean welding seam in TIG welding, which is very close to the end result. This saves a lot of time while working, since much less time is spent on post-processing. The addition for welding wire can be done in a targeted manner and thus ensures a significantly lower weld spatter. Also, there is only a minimal release of harmful gases, which should be appreciated by every worker with a TIG welding machine. The many positive aspects of our TIG welding machines should have convinced you now, otherwise we are always looking forward to your visit!